Results from the Greater Good trust quiz. Last month, we invited you to take a quiz measuring your level of trust, zeroing in on a close (most likely romantic) relationship of yours. The quiz, based on work by researchers at the University of Waterloo in Canada, measures how dependable, honest, and reliable you believe your partner to be, how responsive you think he or she will be when you need him or her the most, and how much faith you have in your relationship as a whole. So far, roughly 1,700 Greater Good readers have completed the quiz, and apparently, you’re a pretty trusting group. Your median score puts you right smack in the middle of the “high” range of trust, according to the original data collected by the Canadian research team. 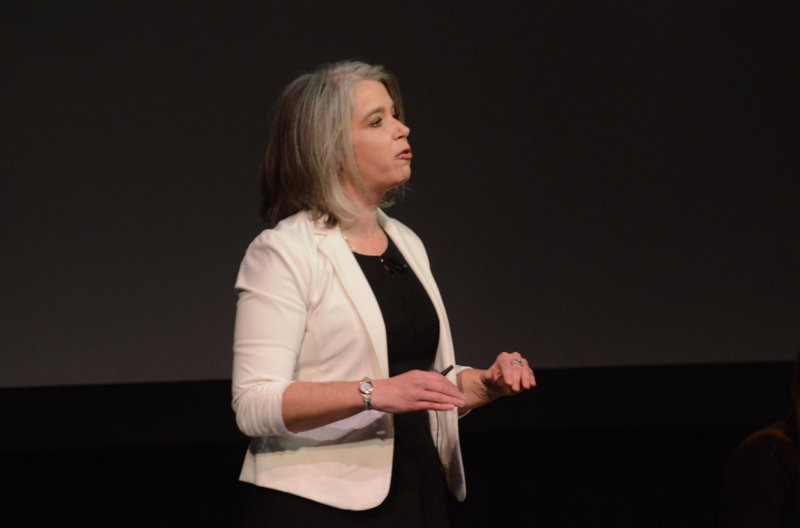 • There was no correlation between trust and age—people didn’t get any more trusting of their partner as they got older, nor did younger people trust more. 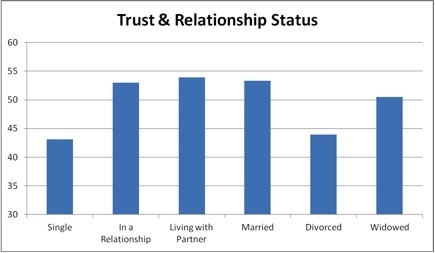 • Relationship status was strongly tied to trust level: People who were in a relationship (living with their partner or not) or married were the most trusting, while divorced people and single people were the least trusting (see graph below). • Their parents’ marital status did not affect how trusting participants said they were. 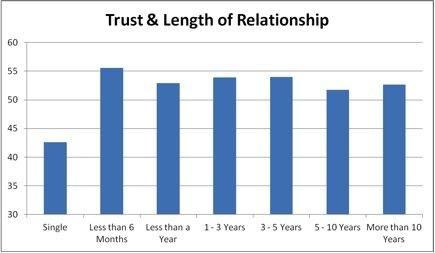 • The length of a relationship was related to one’s level of trust—but the people who were most trusting were those who had been in their relationship for the least amount of time, six months or less (see graph below). • Men in general had a slightly higher trust score than women. 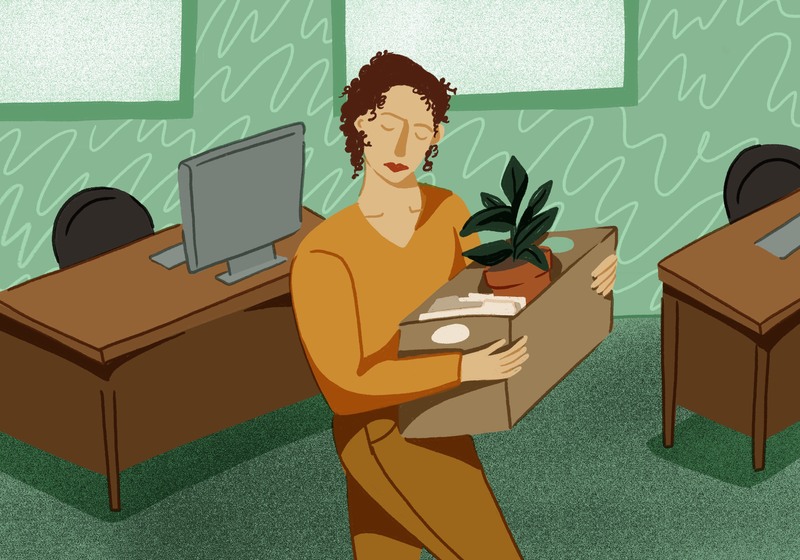 • This gender difference appears most strongly among single and divorced people: Divorced (and single) women were significantly less trusting than their male counterparts. 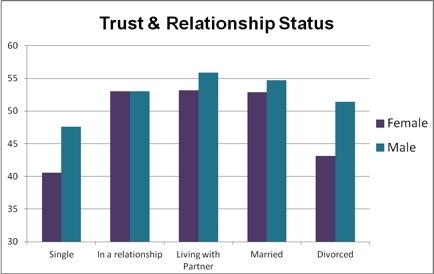 In general, men’s trust was much more stable regardless of their relationship status than women’s (see graph below). We want to hear what you make of these findings. Weigh in with a comment below. Also please take our new quiz on gratitude, just in time for Thanksgiving. And if you still haven’t taken our quick trust quiz, click here to get started. Gregg Sparkman is an editorial assistant for Greater Good, helps maintain the Greater Good website, and volunteers at Greater Good Science Center events. Fascinating! I have to wonder if the lower trust found with single people has to do with reality. Retailers insist that shoplifters are generally by themselves, and I find that I get more respect when I’m with my boyfriend or with other people. Anything from walking down the street (groups of people hog the sidewalk) to signing up with a new insurance company. Single people get treated like doormats. Clarification: that includes single *status*, i.e. even when I’m not with my boyfriend, people seem to respect me more when they hear I’m in a relationship vs when I was alone. about whether being more trusting is good or bad. at first) is that being more trusting is good. dress” in order to stay safe. see who is more trusting.